Tortoise Board - Garden State Tortoise is excited to share a great photo and video of a successfully nesting Hermann’s tortoise (Testudo hermanni hermanni) from the locality of Calabria, Italy—a first in the US. 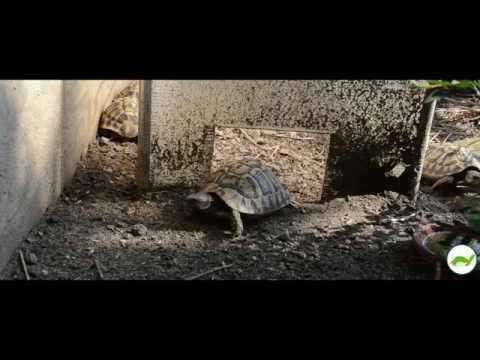 TortoiseForum.org - Enjoy this excellent video from Garden State Tortoise showing the sequence of events from breeding to nesting to hatching for some beautiful Testudo hermanni hermanni tortoises. Tortoise Board - Garden State Tortoise is proud to announce the hatching of some very special Testudo hermanni hermanni tortoises from the Tuscany, Italy locale. Seriously cute little babies! On the Web - This is an excellent article by Chris Leone of Garden State Tortoise, detailing the natural history and taxonomy of the Hermann’s tortoise (Testudo hermanni) and its subspecies.